When it comes to one of the biggest “plagues” to hit our society yet — diabetes — there’s no such thing as too much research. So when I heard about another natural supplement being investigated for the prevention of this disease, I just had to bring it to your attention. I’m talking about mulberry leaf. As you already know, diabetes is a huge health issue in North America. In the U.S. in 2002, almost 20 million people had the disease. By now, that number has probably grown by at least five million. At that point in time, it was also the sixth-leading cause of death. Some research out of Japan has shown that there’s potential for actual prevention in the mulberry tree. This deciduous tree is mostly native to Asia, but also grows in North America. It produces a dark purple, red, or white fruit that can be quite tasty. But this time we’re concerned about the leaves. This study was done to see if there was any truth in the claim that mulberry leaf extract could keep blood sugar levels from rocketing, therefore helping prevent diabetes. First, the researchers wanted to figure out which part and which type of the mulberry tree contained the most “1- deoxynojirimycin” (DNJ), and when. This is the active ingredient that’s believed to have the preventative powers. After doing some high-tech testing, they found that the leaves at the top part of the “Morus alba” variety in the summer contained the highest DNJ levels. They used this extract to make a powdered supplement with a higher concentration of DNJ than the mulberry supplements you can already find in stores. The new mulberry powder contained 1.5% DNJ, compared to the currently generally available 0.1% DNJ products. The next step was to test the new supplement on healthy study volunteers. The participants were given one of four powdered mulberry supplements. Each dose had 0 mg, 6 mg, 12 mg, or 18 mg of DNJ. After they took the supplement, they were given 50 g of sucrose (sugar). The researchers tested the study participants’ blood for blood sugar and insulin levels before they took the supplement and at 30 minutes and 180 minutes after they had taken the supplement and sugar. The researchers found that the just one dose at 0.8 g (that’s 12 mg of DNJ) or 1.2 g (that’s 18 mg of DNJ) of mulberry powder was able to keep blood sugar and insulin levels down after the consumption of sugar. This ability means that this supplement could actually help prevent the onset of diabetes in healthy individuals. The next move should be to test this stronger mulberry leaf supplement on people at risk for diabetes or who already have the disease. Note that the mulberry extracts currently available in the stores contain much lower levels of DNJ than what was used in this study. Watch the shelves in the next few years for a new mulberry product. 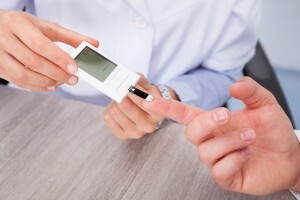 If you think that you’re at risk for diabetes, you must see your doctor.